12 July 2010, at 10:37a.m. BELARUS - Aviagen has held the first ever poultry production and technical seminar in the Belarus Republic. Representatives with a broad range of expertise from veterinary specialists to heads of production attended the event at the Hotel Victoria in Minsk. 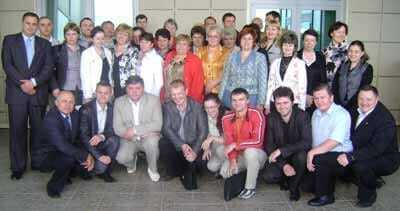 In total, 12 Belarusian parent stock farms were represented. Tyark Osterndorff, Business Development Director for Aviagen's Central and Eastern European team, said: "Aviagen and Belpticeprom are leading the market in the provision of technical support to the Belarus poultry industry. Our seminar was a huge success and I have every confidence that further events will now take place so that we can continue to share experiences and offer advice and guidance to our Belarussian customers." The event began with welcome speeches by Michail Petrashkevich, director of Belpticeprom, Yuri Fesin, a director of PPR Broiler's grandparent site and by Tyark Osterndorff of Aviagen. Following those discussions, Petro Kuretchko was introduced as the technical manager for all parent stock in Belarus. Petro also conducted a discussion on light programmes. Michail Petrashkevich added: "Belpticeprom and Aviagen are committed to developing excellent technical and training support to the poultry industry in Belarus and this superb seminar is one such example of we can work together to deliver practical advice to our customers. The future of the industry in Belarus is very bright."